Internet penetration in the Philippines has nearly doubled in the last four years as more Filipinos turn to mobile phones to access the web, according to Nielsen. 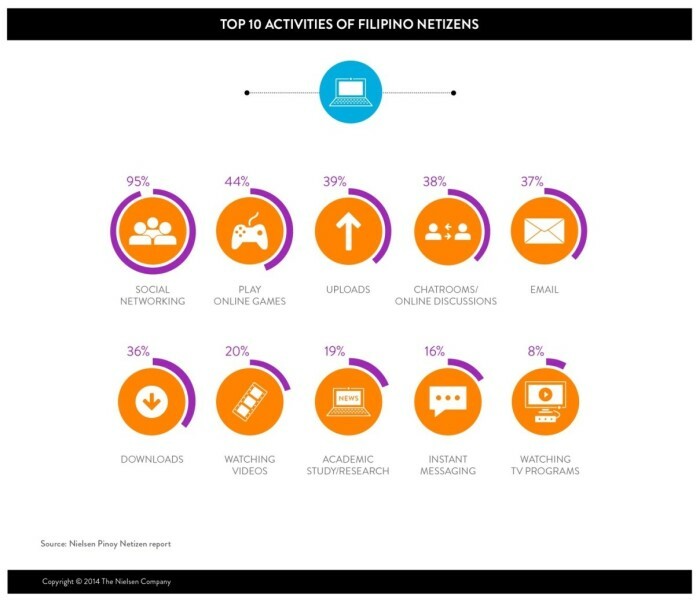 The latest Nielsen Pinoy Netizen report found that 52% of the country’s population now have internet access to date from just 27% penetration in 2010. 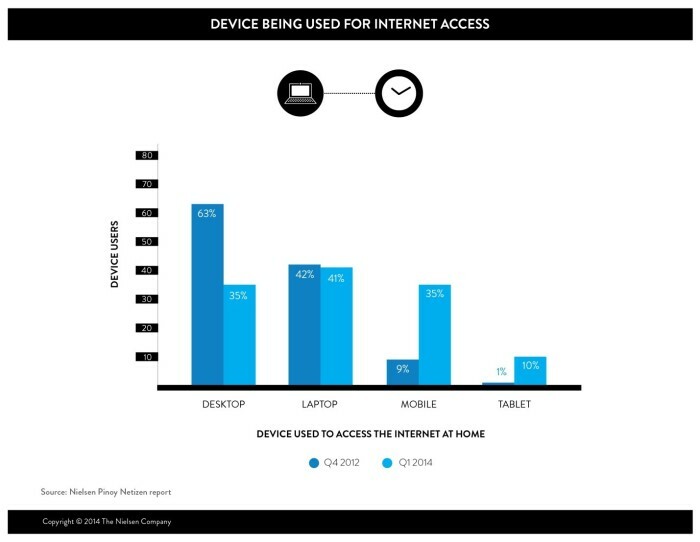 The uptrend follows the decline of desktop computer use as means to access the web at home, replaced by more portable devices like tablets, laptops and mobile phones. From 63% in 2012, desktop use dropped 28 points to 35% this year – now just equal to mobile (35%) which saw a notable 26 point improvement within the same time period. Laptops are the most preferred device for internet access among Filipinos while tablets had a commendable 9 point growth from 2012. Now with the internet only an arm’s length away, Jamieson noted that the Filipinos now visit the internet more often and for far longer – a trend that is “growing proportionally” alongside the mobile boom. 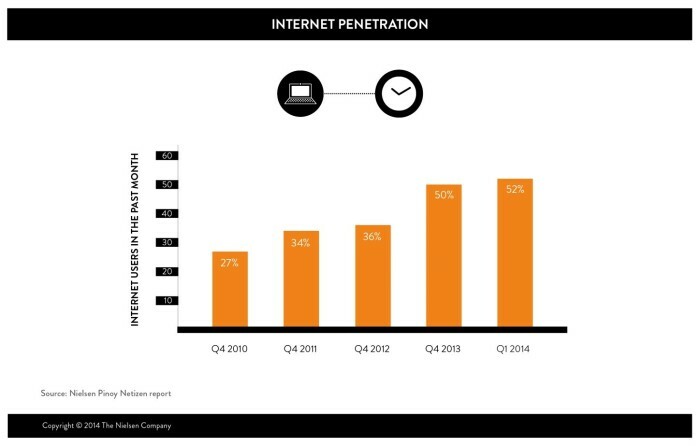 Nielsen data says that almost six in 10 (58%) home internet users are online daily in the first quarter of 2014 from just 23% in the last quarter of 2013. While connected, 33% say that they spend more than two hours a day online, compared to the previous quarter’s 28% on weekdays and 26% on weekends. As to what they access online at home, 95% visit social networking sites while 44% play online games. At the bottom end of the poll are watching TV programs (8%) and instant messaging (16%). Jamieson recommends brands to anticipate this “behavioural shift” from today’s tech-savy and connected consumers. But while mobile gets brands and consumers closer than ever before, the opportunity is not without challenges. “While entry points for online usage are social networking and gaming, the consumer’s world is becoming borderless with vast options and activities that can be conducted online. Marketers need to seek out new and innovative ways to differentiate and stand out from the crowd,” points Jamieson. Following the appointment, Happy Marketer will continue to handle both strategy and management across the brand's key social media..